Vietnam should calculate in advance damage caused by climate change as its effects have become more obvious and devastating in recent years, with changes in temperature and rainfall, sea level rises and extreme weather. 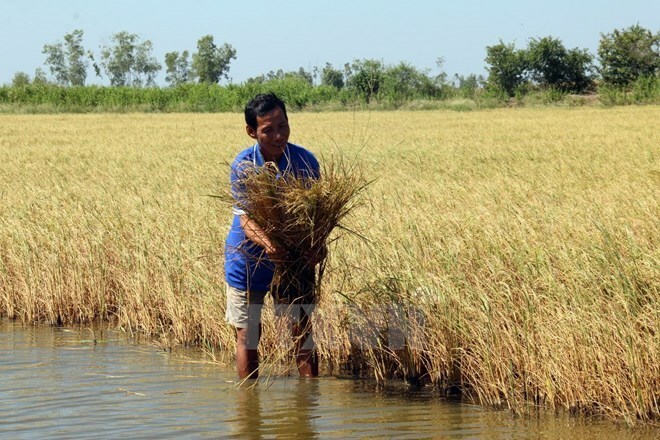 According to the United Nations Development Programme (UNDP) in Vietnam, the drought triggered by El-Nino in 2015-2016 affected millions of Vietnamese farmers and the national economy. Pham Van Tan, Deputy Director of the Department of Meteorology, Hydrology and Climate Change under the Ministry of Natural Resources and Environment, said Vietnam is one of the most vulnerable countries due to climate change. However, many organisations, businesses and locals have not been fully aware of climate change and green growth, he said, noting that coordination between ministries, departments and localities is lacking. To date, all ten relevant ministries and 63 localities have promulgated action plans to cope with climate change and sea level rises. Nevertheless, only a few ministries and departments study the impacts of climate change on socio-economic development plans. Coping with climate change is a big problem that needs time and investment, Tan said, adding that mobilisation of financial resources from individuals and businesses remained limited. Deputy Minister of Agriculture and Rural Development Hoang Van Thang said Vietnam needs measures and tools to calculate losses caused by climate change. According to the Ministry of Finance, Vietnam needs to address relations between promoting growth and coping with climate change in each period and mitigate its negative impacts and enhance adaptation to climate change to bolster sustainable development. More social investment should be mobilised to implement strategies and plans on climate change adaptation and green growth. The Ministry of Planning and Investment along with relevant ministries and departments has proposed the arrangement of public investment in 2016-2020 to focus on preventing saltwater intrusion and coastal erosions in the Mekong Delta and droughts in the Central Highlands and south central coastal regions. Ministries, departments and localities are stepping up coordination in implementing mechanisms and policies to deal with environmental changes and increase awareness-raising campaigns among the business community and citizens. Akiko Fujii, UNDP Vietnam Deputy Country Director, suggested Vietnam establish an inter-ministry working group to collect data to analyse risks posed by climate change and put forth adaptive measures. According to the World Bank, Vietnam loses 1-1.5 percent of GDP annually due to natural disasters, which hinders the country’s social and economic development.